Had some time to work on the main body and was able to hollow out already the cockpit area. During some polishing with sandpaper, some holes caused by air bubbles showed up in the fuselage. But not to worry since I can cover that up with epoxy or just dab a new layer of plaster on it and file and sandpaper it to return it to its intended shape. That was actually one of the discoveries I made during the scratch building project of mine. Which was that you could pour a new layer of plaster of paris on an old one and they would bond quite well. Of course there is a limit to this as too small an area results in a weak bond that could easily break off during filing and carving. When making the cockpit bathtub, I was able to speed up the process by using a drill to make holes in the airframe which would make scraping out of the plaster easy while reducing damage to the walls. I was worried if I tried to hollow it out using just carving tool, I could break the walls of the cockpit. 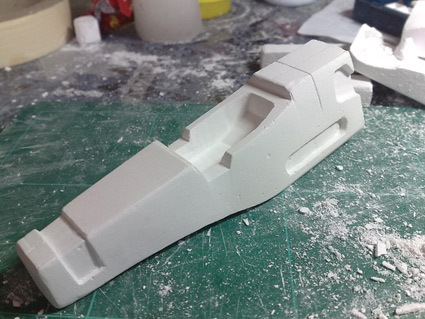 The other part that was finished was the primary side vernier thrusters of the Lancer. The vernier thruster is what makes maneuvering in space possible. 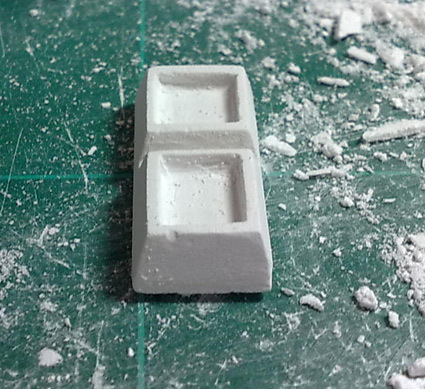 I'm planning to just carve one piece then mirror it to the opposite side when I cast it in resin. Saves on mold work time and materials.